BRIER ISLAND, N.S. 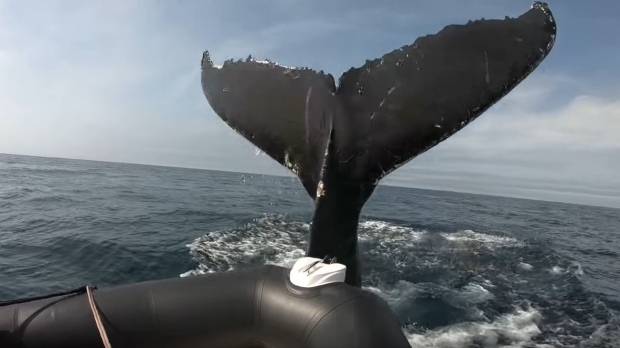 -- A video showing a humpback whale colliding with an inflatable tour boat off the coast of Nova Scotia is making waves online, just a few months after the introduction of new federal rules limiting the distance between vessels and marine mammals. David Mulder, a passenger on the Zodiac inflatable whale watching boat, posted the video from Sept. 2 showing the whale's tail suddenly rising from the water and then hitting the bow of the small boat. Melville, who has been leading whale watching tours for 10 years, said it had been a quiet day on the water, aside from a few spouts earlier in the trip when the whale lifted its tail in front of the boat. Within a few seconds, the animal resurfaced for what Melville calls the "friendly tap" captured on video. Melville estimated that the animal was longer than 15 metres, more than double the size of the boat carrying his seven passengers. "I think people were just awestruck," said Melville. "The boat was officially, quote, 'not under command' but the whale in full command of the situation." 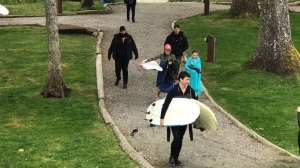 Melville called the event "highly unusual," but he said he's noticed more whales swimming near vessels in recent years as food supplies diminish. "Being incredibly intelligent animals, I think it was partly a curiosity move and partly a little bit of a dominance move," he said. A distance of 200 meters is required when approaching killer whales in B.C. and 400 meters when approaching threatened or endangered species in Quebec's St. Lawrence Estuary. Melville said he hopes the video is a reminder for people to respect these curious, intelligent animals. "We as people, the onus is on us to assess and modify our actions ... in order to accommodate these animals."